Raiders Alum Joe Snively Signs with Caps!!! 12U 2006 Blue - CBHL Regular Season & Playoff Champs!!! 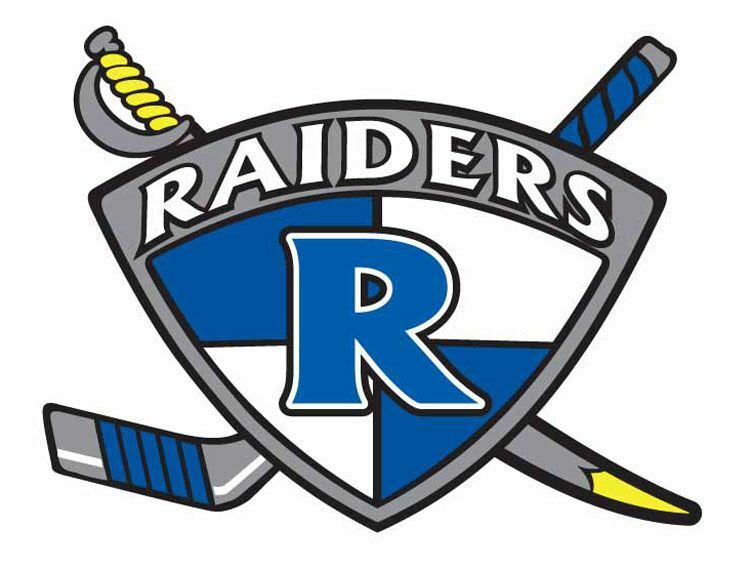 Raiders Travel Tryouts for the 2019 - 2020 Hockey Season will be held May 10th through May 21st, and registration is now open on the Raiders website. Registration in advance is required in order to participate in tryouts. Registration will close at 11:59 pm on Friday, May 10th and no walk-in registrations will be accepted. The cost for tryouts is $100. The club will hold two informational meetings for parents who would like to hear more about the upcoming tryouts, or may have questions about the Raiders Travel Program. Those meetings will be held on Tuesday, April 23rd and Tuesday, April 30th at 7 pm at Skatequest. Additional questions regarding the Raiders Travel Program or the upcoming tryouts may be sent to Raiders Travel Director, David Fishman at . The Reston Raiders Board of Directors is currently seeking candidates who are interested in filling one of three open director positions. The Board of Directors is comprised of 9 elected members. Each board member serves a 3 year term. The Nominations Committee may approve the nomination of an individual who does not meet all of the requirements specified above, if the individual has significant hockey experience that the Nominations Committee believes is essential to the club and warrants such an exception. However, in no case can qualification (1) be ignored. The Nominations Committee is currently accepting self-nominations from prospective candidates. The Nominations Committee will vet nominations and work with the Raiders Board to confirm the validity of those nominations. The committee will also oversee the election process. Garen Duchak has been appointed by the Raiders Board of Directors as the Nominations Committee Chairperson. Club members must self-nominate to be considered. The RRHC Nominations Committee will review self-nominations to certify that the candidate meets the required qualifications. Self nominations should be submitted by email to . To self-nominate, email a brief note indicating why you believe that you meet the qualifications listed above. You will be notified of the committee’s decision about your eligibility before the candidate statements are due. The candidate statement is published to the membership during the voting period. 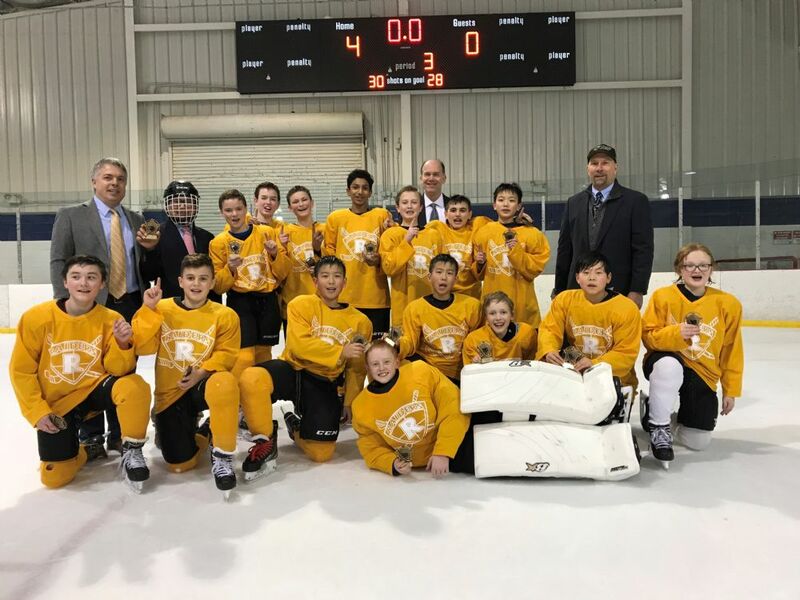 Over the St. Patrick’s Day Weekend, the Reston Raiders 10U Selects competed in their last tournament of the season, the Congressional Cup Spring Classic. The Coaches were collectively pleased with the improvement of the children’s skill development, desire to compete and cohesiveness as a TEAM. Although we started off slowly Friday afternoon, the team continued to improve throughout the weekend, posting enough points to make it to the final. The Raiders led for the entire championship game, dominating zone time and shots on goal, ending up with a 5-2 victory. Highlights included several beautiful assists, banging in rebounds, and a stopped penalty shot in the 3rd. Skatequest and Elite Hockey Science have a number of great Hockey Camps planned for this summer. 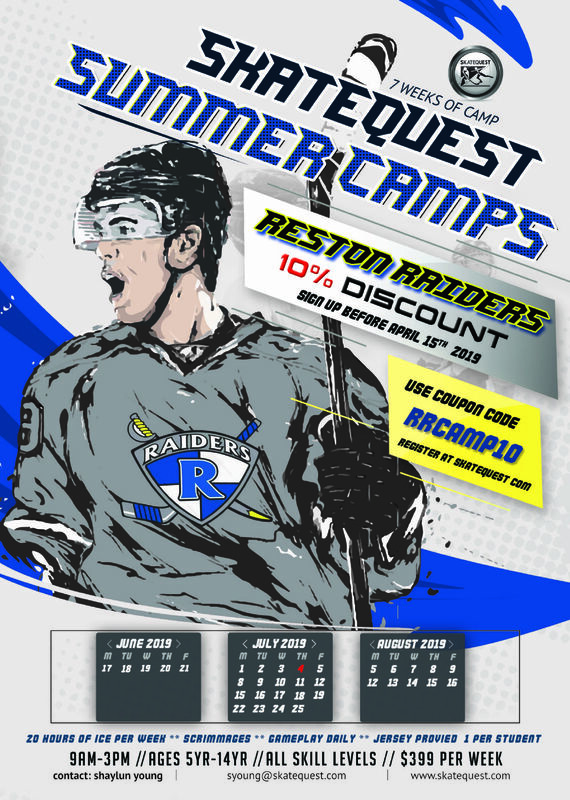 Information and Registration can be found here: Skatequest-EHS Summer Hockey Camps. Raiders Members who register by April 15th can receive a 10% Discount on Camps. Congratulations for Reston Raiders Alumnus, Joe Snively, on being signed to an Entry Level Contract with the Washington Capitals!! Joe played in the Reston Raiders program for a number of years prior to moving onto the Tier I level and playing for the Virginia Statemen and Washington Little Capitals. Joe played high school hockey at Landon before jumping to the Junior ranks in the USHL with the Sioux City Muskateers. 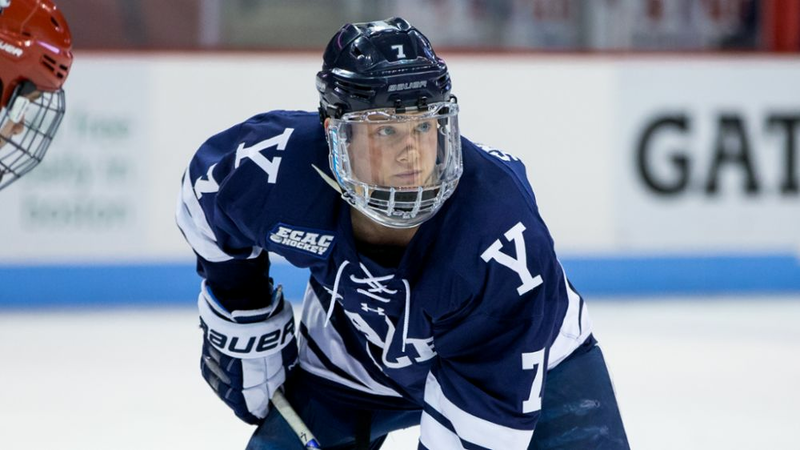 Joe then moved on NCAA hockey with the Yale Bulldogs. Congratulations to Joe and his family!!! The Caps Press Release is below for those interested in reading more. 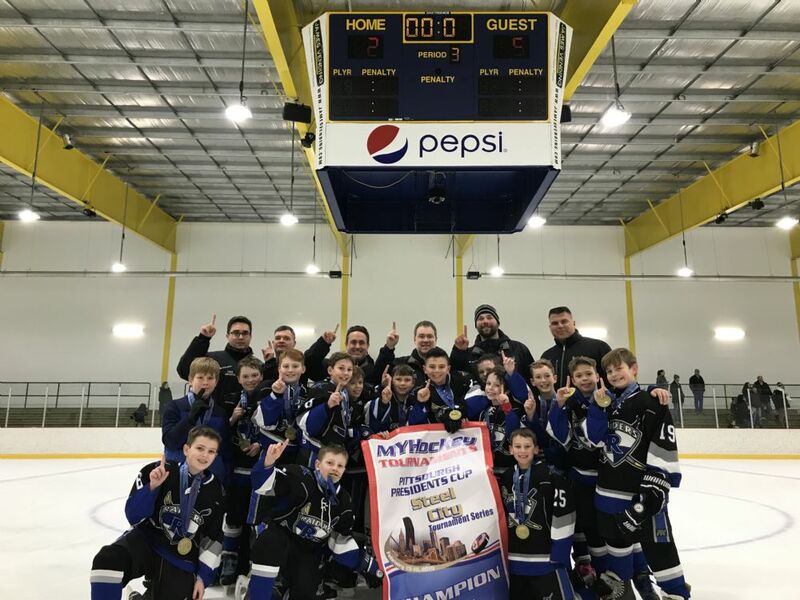 The Reston Raiders 2006 Blue team claimed both the 2018-19 CBHL 12U AA regular season and playoff titles, capping off the double feat on February 24th at the Ashburn Ice House. 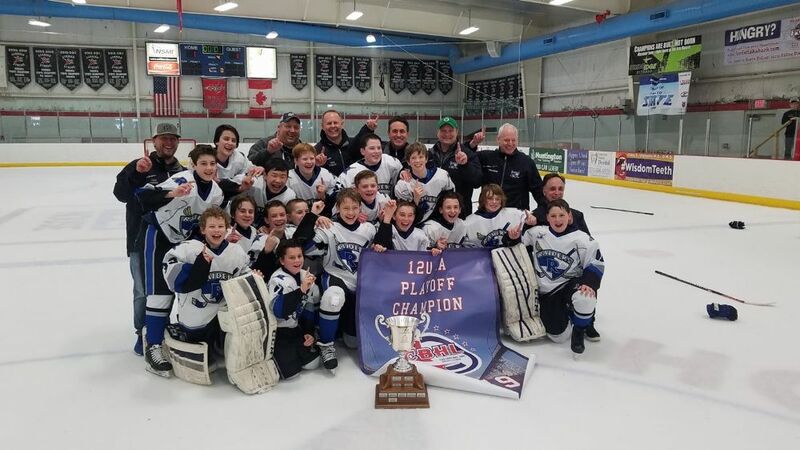 The Raiders finished atop the 12U AA standings with a league record of 16-1-1 and clinched the Bob Otte Trophy as season champs with a 3-2 win over Tri-City on February 9th. The Raiders then beat the same Eagles in the semi-final round of the playoffs, in a game decided in the 8th round of a shootout. That win set up a final against second-seeded Montgomery Blue, the only team to beat the Raiders during the regular season campaign. In the Final, the Raiders grabbed a 1-0 lead late in the first period only to see the Blue Devils equalize in the second. The Raiders outshot Montgomery 13-4 in the third period, but couldn’t put another one past the stellar MYHA Blue netminder. Despite several more quality scoring chances in the five-minute overtime, the Raiders were forced into a second straight shootout to decide their playoff fate. The Raiders scored the only goal of the nine penalty shots taken in the shootout and after the last MYHA miss, a raucous Raider celebration began. The 2006 Blue team finished the season with an overall record of 32-11-3. In addition to the CBHL season and playoff titles, the Raiders won the 2019 Liberty Cup (Philadelphia) and acquitted themselves very well in the prestigious CCM World Invite (Chicago), Harborcenter Cup (Buffalo), and Mid-Winter Classic (hosted by Pittsburgh Pens Elite) tournaments against top Tier 2 and AAA teams. 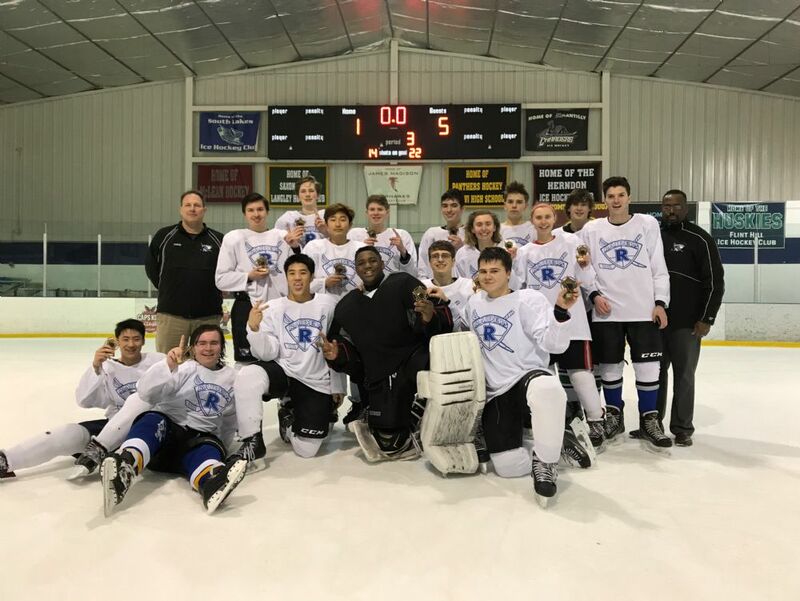 Other highlights from the season include wins over the nation’s top-ranked Tier 2 team (South Hills (PA) Panthers) in February, Pittsburgh Pens Elite Black AAA, Anaheim Jr. Ducks and North Toronto. 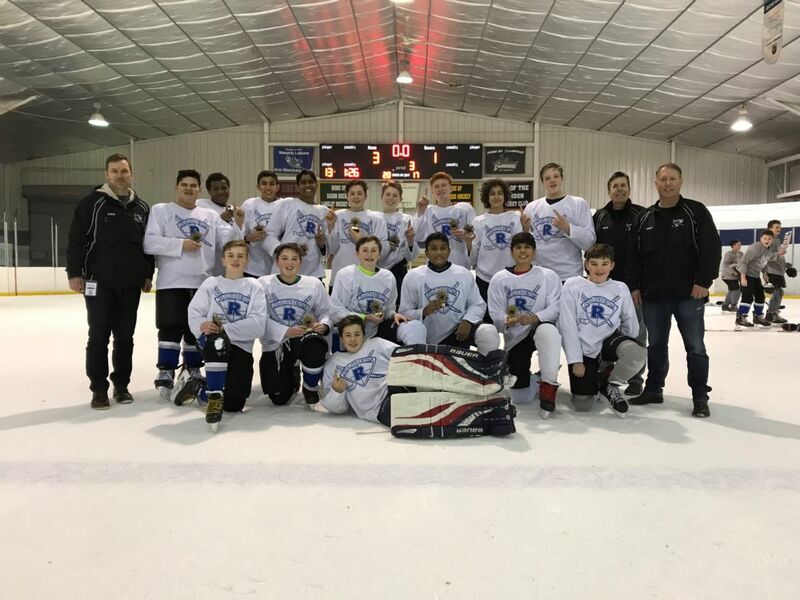 The members of the 2018-19 CBHL Champion Reston Raiders 2006 Blue team are: Hunter Bauer, Kai Blevins, Alex Bovim, Max Cusick, Graham Haberl, Peter Kuligowski, Vincent Lowery, Carson Marr, Connor Morgan, Benjamin Norton, Amadeo Pivonka, Brendan Robinson, Vincent Scodellaro, Rocco Somma, Peter Turner, Christopher Valko, and Aleksey Zubarev. The team is coached by Matt Scodellaro, Matt Somma, Sean Turner, Mikhail Zubarev, Paul Norton and Chuck Robinson, managed by Kelly Morgan and supported by Mike Bauer (Video Coach), Chris Blevins (Statistician), John Haberl (Treasurer), Pat Wildman (Advisor), Jozef Valko (Dietician), Shaylun Young (Skills Coach), Joe Keyser (Goalie Coach) and Mark Nemish (Strength & Conditioning Coach). 16U/18U Midget House League was competitive this season with good parity in the rosters and final standing results very close among the four teams. Team #2 (White) started slow with an 0-3 record and was 2-6-1 through its first nine games. The team warmed up in mid-December, finishing the season on a 9-0-2 run, including five straight playoff wins through the Championship game. In the semi-final game we came back from a two goal deficit to win a close 6-5 victory. It is a very special and self-assured group that can play Taylor Swift’s “Love Story” as their pre-game pump up ballad and Team anthem! Coaches Rinaldi, D’Haiti and McKinley congratulate the players: Brandon Baumgartner, Ben D’Haiti (G), Michael Gentry, Emma Johnson, Miranda Johnson, Derrick Kwon, Aristo Maggio, Ian McKinley, Dillon Nguyen, Ethan Nguyen, Alex Rinaldi, Max Rountree, Matvey Starchenko, Jake Seybold, Hayden Towle, and Connor Witt. The Team 1 "Blue Megalodons" won the Squirt House Championship with an improbable playoff run capped by a dramatic shootout victory in the championship game. After winning only two regular season games, House Team #1 (Blue) led by "Sandman", "Colbeast", "C-Money" and Scotty Wells, the team had an exciting playoff run and took home this season's title. Scotty was perfect in the shootout, at the top of his crease and stopping some very hard, challenging shots in the shootout. Coaches Fontaine, Gibson, and "Papa Hockey" are proud of the team's tenacity and season-long personal progress each of the players made to become Champions! Our 10U championship team: Carter Andrea, Edward Bredehoft, Joss Clark, William Dwyer, Ryan Emerick, Shane Gibson, Brandon Nguyen, Matthew Serletis, Luke Shapiro, Alexander Silva, Brandon Silva, Nicholas Swigart, Colby Walker, Scott Wells and Aiden Wronski. Team Blizzard culminated a roller coaster season and playoff run to win the 14U championship this past Sunday! Wearing white and gritty determination, Team Blizzard stormed into the playoffs, winning their first two round robin games, dropping the third to their season long nemesis Team Baguette. Seeding for the semi-finals would foreshadow the weekend games as Team Blizzard was seeded in first by a tie breaker! The semi-finals saw a dramatic finish in the first game in what many are now calling the come-back game of the year. 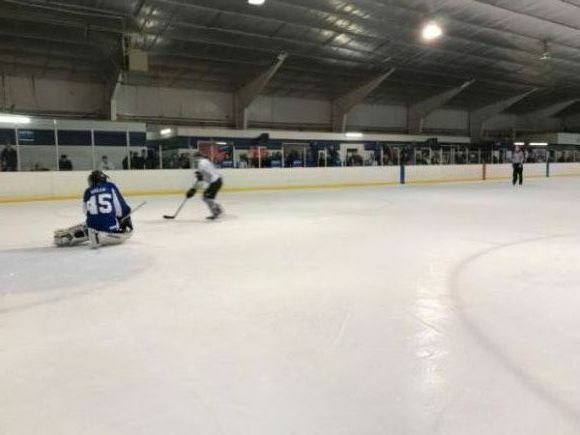 Team Blizzard went into the third period down 3-0; got to 3-2 with about 2:00 left; and scored the equalizer with 25 seconds left on the clock. With the extra momentum they scored with about 1:30 into the sudden-death overtime to take the win and advance to the championship game. Sunday, Team Blizzard faced a tough opponent in Team Baguette. The Baguette’s struck first and the game remained 1-0 through the first two periods. Team Blizzard was finally able to get the tying goal mid-way through the third and then the game winner shortly thereafter. An empty net goal was added late in the third to seal the victory – congratulations Team Blizzard!! 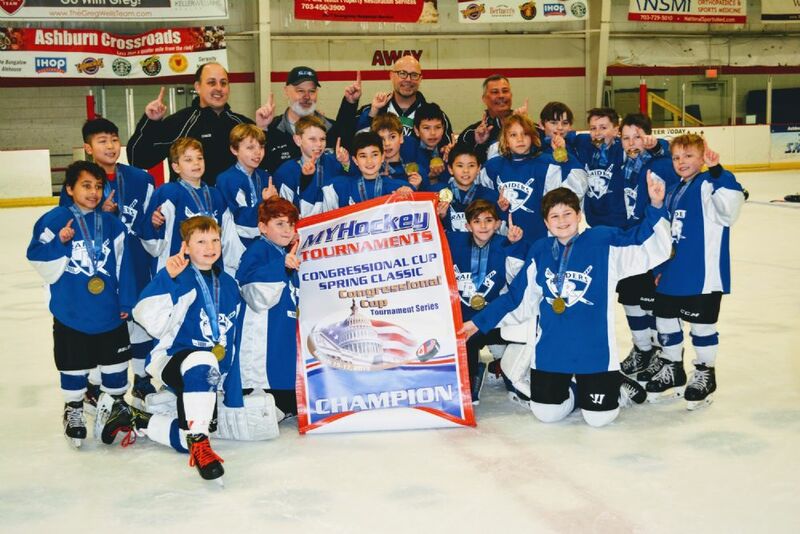 A trip to western PA turned into an exciting weekend for the 2009 Blue team. Entering the tournament, we weren’t sure how we’d fare, but with strong wins against the Rochester NY Coalition (5-2) and the Pittsburgh Predators (7-3), we entered Monday morning with a guaranteed slot in the championship game, but knowing we’d be playing the same team in both games that day. We came out first thing in the morning a step slower than we had in our previous games. The Warrior’s best player used his speed to put us on our heels and while battling valiantly, we lost the morning game 7-2. Between games, the players had a chance to grab some breakfast and focus on meeting their goal – to win the championship. In game 2 of the day, the 2009 Blue team attacked the Warriors constantly, forcing turnover after turnover. The players, as they have all season, just wouldn’t give up. The kept the pressure on the Warriors and jumped out to a 2-0 lead early in the second period. But as the second period wore on, the Warriors were able to chip away at the lead and we ended the 2nd period tied 2-2. When the kids could have quit, they did the opposite. 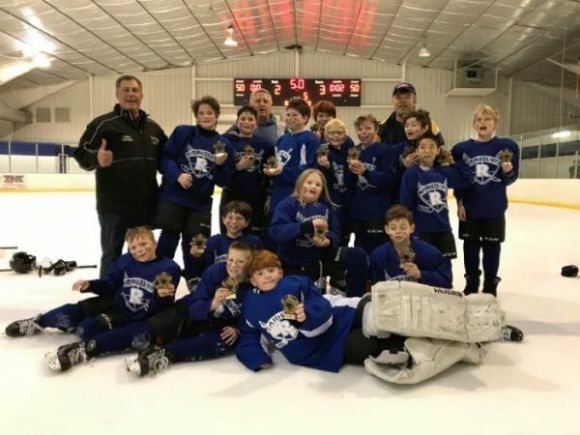 They increased their tempo and took control of the game by scoring 3 third period goals to win the championship for their second tournament win of the season. Congrats to the 2009 Pittsburgh President’s Cup champs for an amazing tournament and great season. 12U Team 4 the “Yellow Gang”, the #3 seed, earned a hard fought Semi-Final victory against the #2 seed (Team 3)coached by Greg Hanson. It was a hard fought win coming off a 7-1 loss to Team 3 just a week prior. The Yellow Gang then faced the regular season and playoff #1 seed (Team 2)coached by Brendan Ford. In the low scoring final, the Yellow Gang got contributions at both ends of the ice. Led on offense by their season leading scorer Eamon Carew and on Defense by their defensive anchor Will Jenkins... the “Gang” was able to only score four goals against a stingy Team 2 defense effort. But as he has done all season... Yellow Gang goalie Jack Hume showed all why he was and is the team MVP, throwing down a shutout against the powerhouse and top scoring team in the league (Team 2) offense. Coaches Hempen, Behrend and Kelly congratulate the Yellow Gang on finishing the playoffs with two outstanding games. *”The Gang” joins the rest of the PeeWes in thanking U12 commissioner Garen Duchak, House VP John Gary and House Head Coach John Sherlock for the efforts this season and commitment to the RRHC House program.